Over the last few years Pirelli have really upped the game when it comes to suppling top quality tyres for classic cars, which includes some important tyres for people who want their classic Alfa to drive and look the way it would have done when it was first produced. When radial tyres were first produced they were made for 400mm wheels for the Citroen Traction Avante, instead of using imperial inch sized wheel. The first radial tyres were in the size 165R400. Radial tyres were initially intended to improve the longevity of the tyre tread, by stopping the foot print of the tyre moving and twisting while it was in contact with the road. Fortunately this also has the added advantage of dramatically increasing the grip, and because of this, the Italian wheel company Ruote Borrani Milano (www.borrani.com ) started making millimetric wheels for cars like the 250 GT Ferrari and the Aston Martin DB2/4 so they could take advantage of this new radial tyre technology. This is also the reason that the Alfa Romeo 1900 came fitted with 400mm wheels. Pirelli are again producing their 165HR400 PIRELLI CINTURATO ™ CA67 tyre that they first started making back in 1952. These tyres were fitted to Alfa 1900, 2000 and the 2600. They are also the only tyre produced for a 400mm rim that has an H speed rating and are suited for sports cars. As things moved along Pirelli started making their radial CINTURATO ™ to fit more normal inch sized wheels hence the 155HR15 PIRELLI CINTURATO ™ CA67 that was fitted to the Giulietta, the Duetto spider and the early Giulia. They also make the 165HR15 PIRELLI CINTURATO ™ CA67 for the Giulietta Gardinetta. In 1969 the majority of Alfa’s sporty little cars changed from fitting a thin 155R15 tyre and moved on to 14” wheels to fit the slightly wider 165HR14 PIRELLI CINTURATO ™ CA67 on pretty much everything they made right through to the late ‘80s. 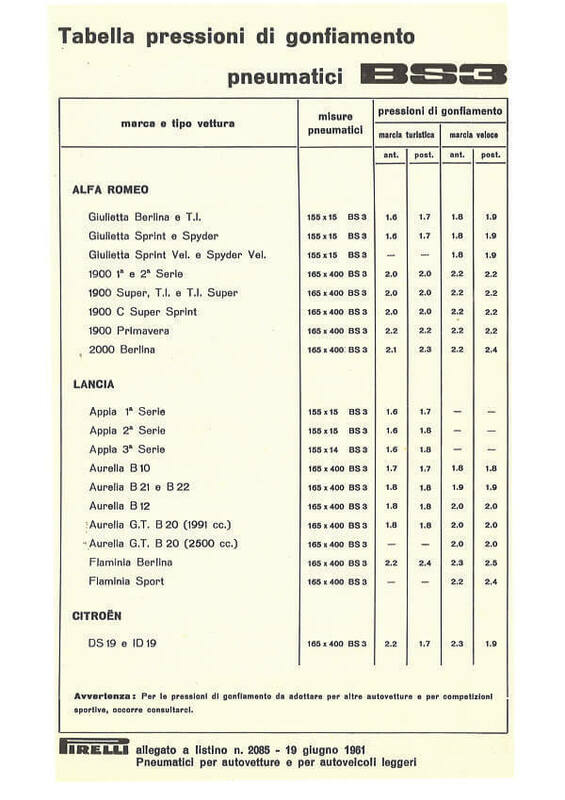 20 years after the development of low profile tyres Alfa were still fitting 165R14 tyres because they handled better than a wider tyre on a light weight sports car. One of Pirelli’s newest reintroductions is 185/70VR14 CINTURATO CN36 As was fitted to the Alfetta GTV. Today so many people want to fit a wider tyre on the Spider and Gt cars, and a 185/70VR14 tyre is a wider equivalent of a 165R14, giving the same overall diameter. Currently the 185/70VR14 PIRELLI CINTURATO CN36 is the only genuine period tyre in that size. There is a theory that modern tyres are better than old style tyres. In a way that is correct. A modern tyre fitted to a modern car, that has been developed to take advantage of what a modern tyre carcass has to offer will give considerably more grip than an old style tyre could ever offer, because the 2 components; the tyre and the car complement each other. That does not mean that an old car, which doesn’t have lots of caster and adverse camber, will have its handling improved by fitting a modern style tyre carcass, that is not suited to its steering and suspension set up. If you dramatically modify your classic Alfa to suit modern tyres then yes you may be able to get more grip, but it will change the handling characteristics of these sporty, fun, light, progressive cars. Alfa Romeo didn’t just draw a tyre size out of a hat, or just fit 165R14 tyres because they were cheap. If price was their major determining factor they wouldn’t have fitted the Pirelli Cinturato. They continued to fit 165R14 tyres to their rear wheel drive sports cars 15 years after the option to fit a wider low profile tyre was available, because they handled better on these thinner tyres. However when considering driving an old car on a modern road, you might think you want more grip. The concern is that modern cars can stop so quickly with their anti-lock braking systems. It is reassuring to know that today’s classic Alfa Romeo tyres from Pirelli, arguably one of the world’s best tyre manufacturers, are using modern quality control systems to provide you with a product that won’t let you down. Pirelli’s Cinturato range of classic tyres are built with up to date modern compounds developed to move water quicker than they ever could in the past, and provide the best possible levels of grip from the relatively small foot print that Alfa Romeo, through all their testing, knew was the best size tyre for their cars .